This Live Giant Squid in Japan is Not a Kaiju! Ladies and gentlemen in the Land of the Rising Sun, there is no reason to activate the Kaiju Emergency Alert System! Sure, this monstrous squid was spotted swimming just offshore last week, but it is a perfectly normal animal. Yet appearances are extremely rare because it lives so deep in the ocean, making the creature practically mythical! And this one’s appearance would be rare if it happened anywhere except Toyama Bay, because giant squids have been confirmed to have visited those waters no less than 16 times! However, this latest sighting and recording is by far the clearest footage on record! Get this: Scientists who have examined this footage have declared this specimen of the genus Architeuthis to be just a juvenile! Seeing the beastie live and up close, it’s not hard to sympathize with the sailors of old who were inspired by this terrifying creature to trade stories of the legendary kraken! Speaking of which, has anyone read the 2010 novel Kraken by the brilliant China Miéville? It prominently features an Architeuthis. It’s a wonderfully layed fantasy mystery that is equal parts a study of gods and human(?) monsters and also questions which particular religion’s apocalypse will end the world. Read it! Architeuthis would be proud of you. He Wore Blue Velvet? Red King Crab in Disguise! An extremely rare blue-colored red king crab has been plucked from the Bering Sea – and it’s at least the second specimen captured this year. Back in January, another lavender-hued crustacean was pulled from the same waters. The best answer I can give you is, I have no idea. My hunch is it’s just a very rare mutation and expressed in only few individuals within a population. Here we have perhaps my favorite favorite photograph — more than the cyclops shark and more than the frozen bubbles — an actual living cat glowing with bioluminescence. 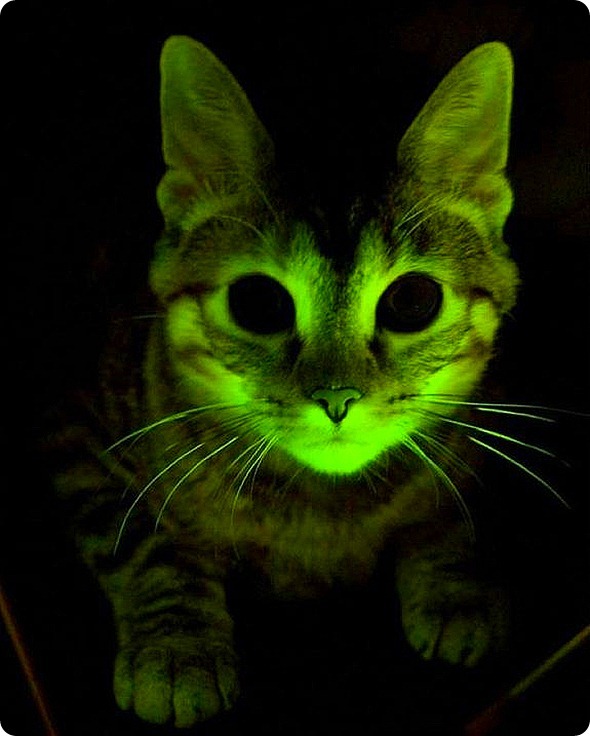 Yep, this cat glows with internal light. Now, before you go turning off your room lights, this kitteh is special. Scientists splices his genes with the cells that make a certain jellyfish glow naturally. The result is an unearthly greenish aura around this cat — who, I stress, was not harmed by the process. My little green buddy looks ready to join the Green Lantern Corps! With the year rapidly coming to a close, I wanted to do some fun posts to wrap up 2011, so I thought I’d take a look at the year’s best photographs — according to me. These are the pics I liked the most or that affected me in some way that made them memorable. There’s no particular ranking to the photos, and I don’t particularly care what official photographic organizations think of them. 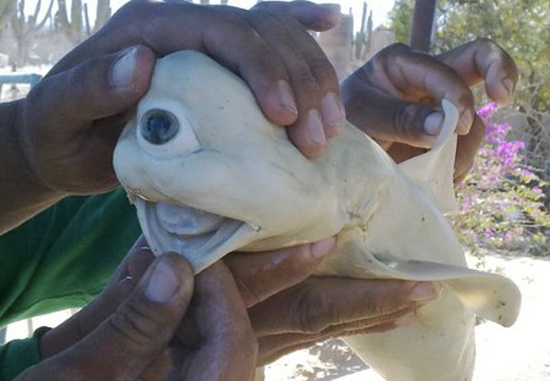 First up is a photo that freaked me out when I first saw it back in June: The cyclopean albino shark fetus. The mysterious, milky mutant instantly went viral. However, this looked SO fake that I couldn’t believe the photo was getting wide distribution; there was no way it could be real, right? A shark’s eyes are located on the sides of its head, so even if it had only one, it wouldn’t be in the middle of its nose on the front of its head, right? The pale thing even resembled a ghost more than a real shark.